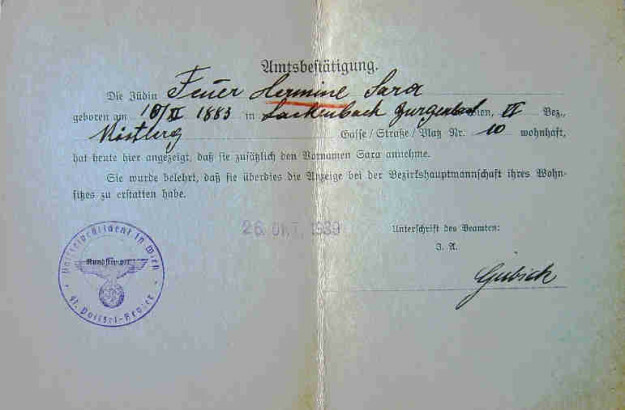 In addition to the previous article “J” stamped German passports and their stories, A fellow collector made a comprehensive summary on the applicable decree and the use of jewish names. The picture at the end of the article is also from a fellow collector and shows a official document from Oct. 1939 confirming that mentioned lady has additionally attached the middle name “SARA” to her current first and family name. I believe this is a extraordinary document and I never saw such one before. On 17.08.1938 a decree was issued forcing Jews to adopt the middle name “Israel” for men and “Sara” for women. It applied to German and stateless Jews, not to foreigners. The decree was put into force on 01 January 1939. Jews who already had a name contained in a list published on 18.08.1938 did not need to additionally add “Israel” or “Sara” to their names. The list is below (at the end of this article). Newly born Jews could only carry a name mentioned on the list. Jews had to report within one month their new names to the authorities where they were born or married and where they lived. German Jews living abroad hat to report to the nearest consulate. Penalties for non-compliance were prison between 1 and 6 months. This decree was NOT applicable to Austria. On 05.10.1938 (Wednesday) passports held by German Jews living within Germany were declared invalid. Passport holders were required to submit the passports within 2 weeks to authorities for them to be specially marked (“J” stamp). This decree was in force from 07.10.1938 (Friday). As Austria was already incorporated into Germany by that date the decree would include any Austrian passports. Given the sentiments the Nazis had for the Austrian State it is, however, improbable that many Austrian passports were still in circulation. On 24.01.1939 a decree was issued for Austria (and the annexed “Sudentenland”) which introduced the legislation regarding middle names as mentioned above (no. 1). The decree was applicable as from 01.02.1939 and Jews had to change their names within one month from 01.04.1939. All passports issued on or after 07.10.1939 had the “J” stamp. Passports issued after 01.01.1939 should show “Israel” and “Sara” as middle names. Passports issued before would have the “J” stamp and endorsements concerning the names affixed on or after these dates. “Israel” and “Sara” should appear in all passports issued after 01.02.1939. They would automatically have the “J” stamp. Abel, Abieser, Abimelech, Abner, Absalom, Ahab, Ahasja, Ahasver, Akiba, Amon, Anschel, Aron, Asahel, Asaria, Ascher, Asriel, Assur, Athalja, Awigdor, Awrum; Bachja, Barak, Baruch, Benaja, Berek, Berl, Boas, Bud; Chaggai, Chai, Chajin, Chamor, Chananja, Chanoch, Chaskel, Chawa, Chiel; Dan, Denny; Efim, Efraim, Ehud, Eisig, Eli, Elias, Elihu, Eliser, Eljakim, Elkan, Enoch, Esau, Esra, Ezechiel; Faleg, Feibisch, Feirel, Feitel, Feiwel, Feleg; Gad, Gdaleo, Gedalja, Gerson, Gideon; Habakuk, Hagai, Hemor, Henoch, Herodes, Hesekiel, Hillel, Hiob, Hosea; Isaac, Isai, Isachar, Isboseth, Isidor, Ismael, Israel, Itzig; Jachiel, Jasse, Jakar, Jakusiel, Jecheskel, Jechiel, Jehu, Jehuda, Jehusiel, Jeremia, Jerobeam, Jesaja, Jethro, Jistach, Jizack, Joab, Jochanan, Joel, Jomteb, Jona, Jonathan, Josia, Juda; Kainan, Kaiphas, Kaleb, Korach; Laban, Lazarus, Leew, Leiser, Levi, Lewek, Lot, Lupu; Machol, Maim, Malchisua, Maleachi, Manasse, Mardochai, Mechel, Menachem, Moab, Mochain, Mordeschai, Mosche, Moses; Nachschon, Nachum, Naftali, Nathan, Naum, Nazary, Nehab, Nehemia, Nissim, Noa, Nochem; Obadja, Orew, Oscher, Osias; Peisach, Pinchas, Pinkus; Rachmiel, Ruben; Sabbatai, Sacher, Sallum, Sally, Salo, Salomon, Salusch, Samaja, Sami, Samuel, Sandel, Saudik, Saul, Schalom, Schaul, Schinul, Schmul, Schneur, Schoachana, Scholem, Sebulon, Semi, Sered, Sichem, Sirach, Simson; Teit, Tewele; Uri, Uria, Uriel; Zadek, Zedekia, Zephania, Zeruja, Zewi. Abigail; Baschewa, Beile, Bela, Bescha, Bihri, Bilha, Breine, Briewe, Brocha; Chana, Chawa, Cheiche, Cheile, Chinke; Deiche, Dewaara, Driesel;Egele; Fangel, Feigle, Feile, Fradchen, Fradel, Frommet; Geilchen, Gelea, Ginendel, Gittel, Gole; Hadasse, Hale, Hannacha, Hitzel; Jachet, Jachewad, Jedidja, Jente, Jezabel, Judis, Jyske, Jyttel; Keile, Kreindel; Lane, Leie, Libsche, Libe, Liwie; Machle, Mathel, Milkele, Mindel; Nacha, Nachme; Peirche, Peßchen, Pesse, Pessel, Pirle; Rachel, Rause, Rebekka, Rechel, Reha, Reichel, Reisel, Reitzge, Reitzsche, Riwki; Sara, Scharne, Scheindel, Scheine, Schewa, Schlämche, Semche, Simche, Slowe, Sprinze; Tana, Telze, Tirze, Treibel; Zerel, Zilla, Zimle, Zine, Zipora, Zirel, Zorthel.